Front photo: Heading towards first. Back photo: The follow-through of a swing. Better photo? : Nothing too spectacular for back-to-back posts, although both give the vibe of coming from the exact same plate appearance. A slight nod do the front photo. 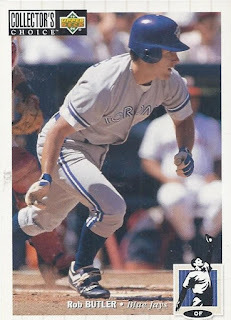 Ties to my personal collections: Pictured as a Blue Jay - would also fit into my mini-collection of MLB Canadians. Wiki-facts: Spent 5 seasons with the Toronto Maple Leafs. The Inter-County baseball league's Toronto Maple Leafs. Google it: Runs a baseball academy in Ajax, Ontario. That's just a little bit east down the 401 from Toronto. 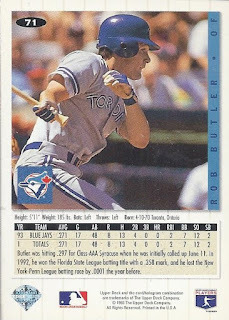 How was his stike shortened 1994? Batted .176 with 5 RBI over 41 games. 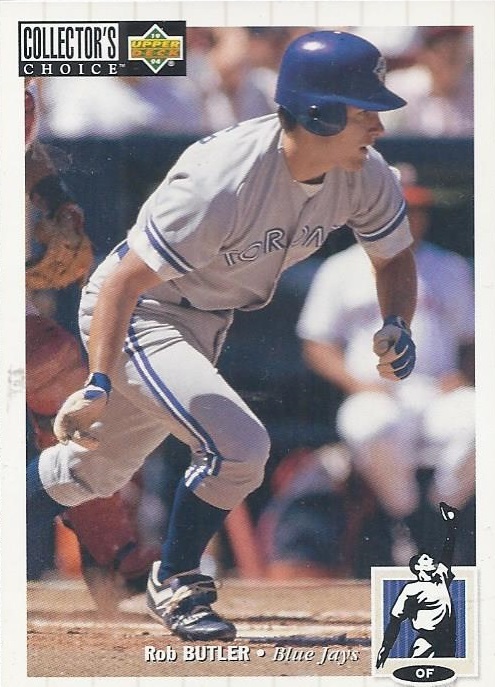 Those were his last games with the Jays until 1999. Birthday boy: April 10, 1970. That wasn't a good day for Beatles fans, as Paul McCartney left the group, effectively breaking up the band. NFLers J.J. McCleskey and Sean Gilbert were born that date as well. No NBAers were born that date, but NHL tough guy Enrico Ciccone was.